salsa and greek yogurt for serving. In a medium mixing bowl whisk together eggs, salsa, salt, and pepper. Set aside. In a medium pan heat up the olive oil and sauté pepper and onion until soft and translucent. Stir in the taco seasoning and cook for another minute. Add about 1 tablespoon of water to the pan if the seasoning sticks a little to the bottom. Divide the onion and pepper mixture among the muffin pan. Place 1 tablespoon of black beans per muffin cup. Divide the egg mixture among the 12 muffin cups. I used about ¼ cup per muffin cup. 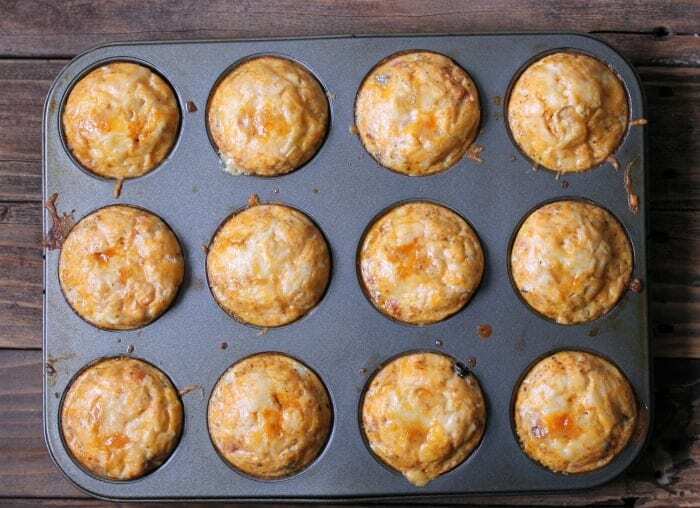 Add 1 tablespoon of taco cheese to each of the muffin cups. Place in the oven and bake for 20 - 21 minutes or until the eggs are set. Remove from the oven and let the egg cups cool slightly. Glide a knife around each cup and remove it from the muffin pan. Serve with salsa and plain greek yogurt. This recipe can be made completely ahead of time and stored in the refrigerator for up to 5 days or frozen up to 3 months. Reheat in the microwave.